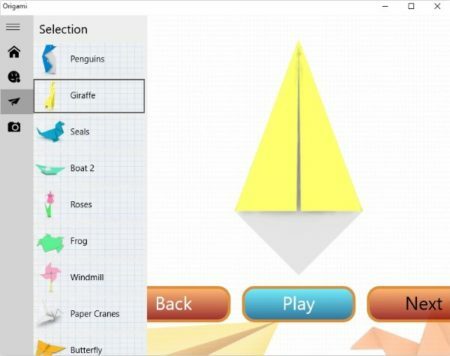 This article covers free Windows 10 Origami apps. Origami as you might know is the art of paper folding and making beautiful shapes out of them. The technique of Origami is associated with Japan. The most interesting thing I find about origami is that the models are made out of paper without cutting or gluing them. So it is just folding paper and making beautiful shapes out of them, which amazes me the most. Learning Origami is for everyone. Kids would love making shapes out of paper and adults would enjoy the creative process in their own way. 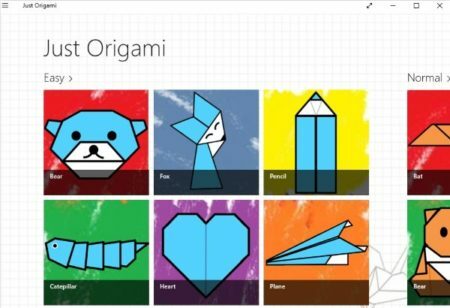 So we searched the Windows 10 store and found some nice origami apps. Let’s have a look at the free Windows 10 Origami apps below. Origami is the first app in this list to learn this paper folding art. The home page of this app can be seen in the screenshot above. The app has a pretty neat interface and you can click on the begin button to start with the app. Once you click the begin button an additional menu will appear next to the main menu. This additional menu will have all the shapes mentioned on it which you can try and make. When you click on a shape, the tutorial for that will open up on the window to the right. This can be seen in the screenshot below. The tutorial is given in very easy steps. You can complete one step and then press the next button to go to the next step. This step by step instructions make learning really easy and fun. 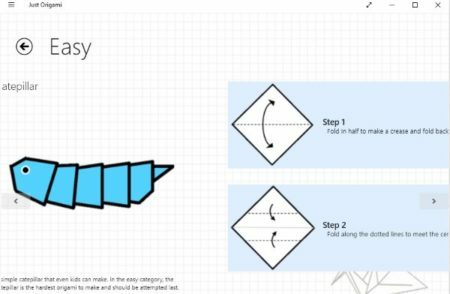 You can check out a detailed description of Origami for Windows 10 here. Just Origami is another good app to learn origami. When you start this app you will come across an interface like the one shown in the screenshot above. App the shapes that you can make using this origami app are listed on the home page of the app as can be seen. 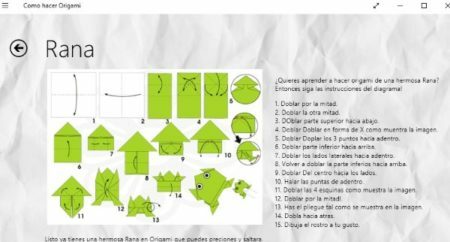 The origami shapes are divided into 3 categories easy, normal, and advanced depending upon the difficulty level. Select a shape that you would like to make. The shape will open up in your app window as can be seen in the screenshot below. The steps to paper folding are given alongside the shape you are making. Just follow the steps and scroll to go to the next step. You can easily make a shape using these step by step instructions which are clearly given with instructions to follow. You can check out a detailed description of Just Origami for Windows 10 here. 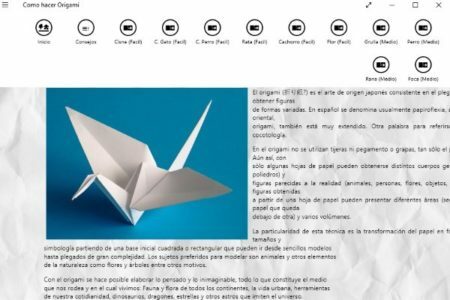 Como Hacer Origami is a origami app built in Spanish. All the text in the app is also in Spanish. The home page of the app can be seen in the screenshot above. When you right click on the app window a menu will open up at the top of the window. These are all the shapes that you can make using this app. I you are not able to understand the names in Spanish, then don’t worry. Just click on a shape and it will open up in the window below. From the shape you can make out which animal it is. Like the one I opened can be seen in the screenshot below. This particular shape is that of a frog. So if you are not able to read the Spanish instructions just follow the given drawings. Follow the paper folds made in each drawing and you will be able to complete your paper folding task. If you want to read the instructions as well then you can copy paste the text in Google and translate it to English. These are some Windows 10 apps which will make it easy for you to learn paper folding skills. You can learn to make various shapes using these paper folding techniques. Origami is pretty fun and interesting to learn. 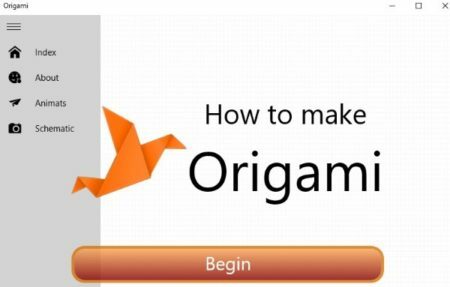 Try these apps out to learn origami.